We just put together another awesome deal for you guys ? 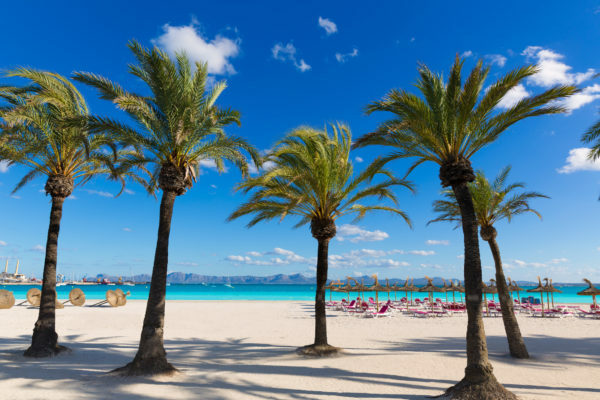 For only 1109 DKK (assuming a trip with 4 persons) you can take a 8-day trip to beautiful Mallorca, with a very good apartment and flights included. For a trip with 2 persons you will only pay 1278 kr. This is possible through a separate booking of flight and hotel. You’ll be staying 7 nights at the awesome Apartamentos Cristina. The apartment is just one kilometer away from the beach in Cala Millor. The resort has a good restaurant, a bar and a great outdoor pool with a beautiful view. Free WiFi is available throughout the facility. The Apartamentos Cristina has received great reviews on TripAdvisor and has been awarded with a 4.5 out of 5 total rating from 611 different reviews and has received the Certificate for Excellence. The flights are with Ryanair from Hamburg, Billund or Copenhagen. Included in the price is one piece of hand luggage (10 kg). Checked luggage is available at an additional cost. There are available dates in May, like I’ve listed below. Go ahead and click through the links and see if you can find something that fits with your schedule. If you’re looking for different hotels on Mallorca, check out Trivago for the best deals. In the month of May and June it is already very warm in Mallorca. Temperatures rise to 27 degrees, an ideal weather to discover the island and to escape from the mass tourism. Doesn’t this sound like a relaxed and memorable journey? Watch out: When you click on the flight link from a smartphone, the total price for 4 persons will be displayed.